Turning your brilliant idea into a world-beating product requires a lot of things – drive, commitment, flexibility and often a large slice of luck. But one element it can’t really do without is money – whether to develop prototypes, employ staff or simply pay your own bills. Finding funding has never been easy, but the range of potential sources does seem to be growing. As well as traditional sources such as VCs, banks, angels and friends and family, there are a range of government grants and multiple competitions that can potentially help startups take a step forward. I’m not saying this necessarily makes gaining investment easy, but it does give more options. And another option that is expanding rapidly is crowdfunding – sharing your idea with the world and getting them to back it before you start the expensive business of actually producing anything. If you don’t attract the pre-orders then it should probably act as a wake-up call – are you producing the right product that people actually want? There’s been a run of successful, over-subscribed launches on sites like KickStarter. The company behind the Pebble smart watch raised over $10m and will start shipping real products this month. On a smaller scale, projects like photography book I Drink Lead Paint hit its target of £10,000, unleashing the thoughts and images of Mr Flibble onto the world. And B2B versions like Funding Circle have attracted government backing, making £20m available to British businesses over the next 12-24 months. With growth like this, it is no wonder that Deloitte predicts that crowdfunding will double in 2013, raising £1.9 billion globally this year. Not huge in the scheme of overall investment, but potentially opening up funding options to smaller scale projects in a simple way. But, with more and more projects out there looking for crowdfunding, how do entrepreneurs get people to view what they are doing – and potentially part with their cash? Kickstarter’s own stats show that just over 40% of projects hit their funding targets, showing it isn’t as simple as launching and waiting for the money to roll in. This is where an enormous opportunity arises for the marketing and PR industries to get involved. Crowdfunding projects need marketing in the same way as any other product, identifying target audiences and demonstrating the benefits your new wonder widget brings to them. And then you’ve got to reach them, using both social and traditional media to identify the influencers that are likely to help you spread the word and convincing them and the world at large. Obviously the downside is that projects don’t tend to have any ready cash, but for anyone brave enough to go for payment by results the business is out there. At a time when the PR industry is suffering financially, creating smart, all-in-one services that help you get crowdfunding or launch your new iPhone app are just what it needs to be developing to recapture growth and build relationships with the next generation of smart businesses. Bye bye angels, hello Kickstarter? There’s been a lot in the press recently about crowdfunding site Kickstarter. Electronic paper watch Pebble raised over $3.4m for its smartphone linked timepiece while the first Kickstarter scam – trying to get backing for a non-existent video game has just been uncovered. At a time when money is tight Kickstarter and other crowdfunding sites look like the perfect way for startups to raise cash. Essentially you pitch your idea to a receptive audience of people that want to be able to buy your product – and they fund your development in return for a small stake. Your product gets validated by the market, future sales are generated and you get backing – what could be simpler? It also provides another opportunity for public relations agencies to extend their reach by using press and social media campaigns to build a buzz and drive people to their client’s Kickstarter page. However while Kickstarter is great for certain types of products, it can’t replace more traditional types of funding. First off, the Kickstarter audience is comprised of early adopters – the type of people that are going to spend $150 on a watch that links to their smartphone and are happy to pledge money to get it built. It won’t work for mainstream products that need to appeal to a more conservative, mass market demographic. Secondly, startups need a lot more than money to succeed – they need help, connections and business advice from people that know what they are talking about. This is something that angel investors and VCs both provide over and above cold hard cash. Otherwise the risk is that companies raise the cash on Kickstarter but then can’t make best use of it as they run into technical, marketing or sales issues that outside advice could have helped with. 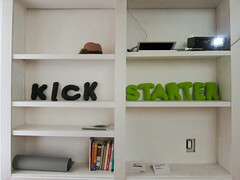 So while Kickstarter is a good (and cheap) way of validating your idea for startups building physical products it can only be part of the story – if you want lasting success you still need to knock on doors, make the contacts and do the hard work.